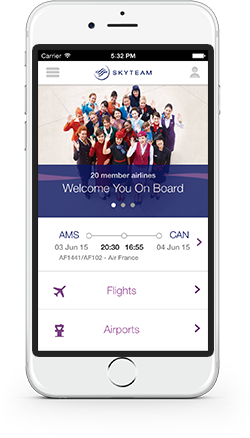 AMSTERDAM, 05 August 2013 – SkyTeam, the global airline alliance, has rolled out further enhancements to its Global Meetings product. With a minimum of just 50 and no maximum number of attendees, plus generous discounts on flights operated by its 19 member airlines, SkyTeam is responding to industry demand for travel to small, as well as large-scale events. SkyTeam Global Meetings is free to use and event organizers can set up their event in fewer clicks, thanks to a more streamlined registration process that has also been introduced. This year business travel spending in China is forecast to grow by more than 15% and is predicted to overtake the U.S. by 2015. SkyTeam is the #1 airline alliance in Greater China and has hubs in Beijing, Shanghai and Guangzhou – three of the top Chinese business markets - offering event organizers the ideal travel solution in this market. Worldwide, the MICE industry is showing strong signs of recovery and top locations include London, the U.S. (Delta), Spain (Air Europa) and Germany, all markets in which SkyTeam has a strong presence with service offered by multiple member airlines. For more information about SkyTeam Global Meetings, or to register an event, visit www.skyteam.com/globalmeetings or contact the Global Meetings support desk at globalmeetings@skyteam.com. SkyTeam is a global airline alliance providing customers from member airlines access to an extensive global network with more destinations, more frequencies and more connectivity. Passengers can earn and redeem Frequent Flyer Miles throughout the SkyTeam network. SkyTeam member airlines offer customers access to 530 lounges worldwide. The 19 members are: Aeroflot, Aerolíneas Argentinas, Aeroméxico, Air Europa, Air France, Alitalia, China Airlines, China Eastern, China Southern, Czech Airlines, Delta Air Lines, Kenya Airways, KLM Royal Dutch Airlines, Korean Air, Middle East Airlines, Saudia, TAROM, Vietnam Airlines and Xiamen Airlines. SkyTeam offers its 569 million annual customers almost 15,000 daily flights to 1,024 destinations in 178 countries.